Pruning lavender - Not so fast my friends, I’ll explain in a minute, but I will say this right off the bat - lavender really doesn’t need to be pruned so often, even if it’s growing in a window box or planter. 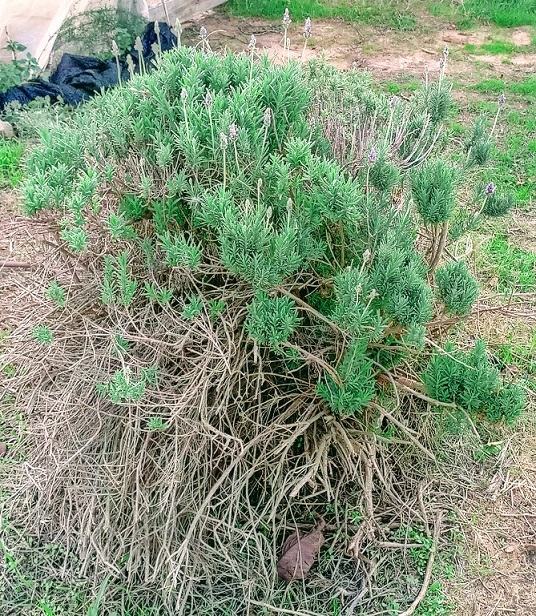 Beside occasionally pruning its dried flowers, there is no reason to prune lavender before its second year. Note - Start pruning lavender only after the second year, and no matter how hard you prune, always make sure to leave a branch of green leaves. But the reality is... that, much like those girls in the magazines, plants grow, and the majority of us are not professional gardeners. As a matter of fact, most of us neglect our plants most of the time. So, if you’re like most people, and have walked past your lavender for the last 3 years, pretending not to have noticed… it’s probably looking a little like the picture below. And that's the reality of it. Now, let me show you how to come back from this situation, how to prune and renew your lavender, bringing it to Super Model status in a matter of weeks. So, let’s prune! When? Your pre-celebration of colors should begin with hard pruning in the spring. Soon after you see new growth. Where exactly? young lavender plants have a unique "forest" that is small and thick and located in the low part of the plant, the part closer to the ground. The "harvest" point is exactly between the "forest’s" upper part and the thin stems of the lower part. 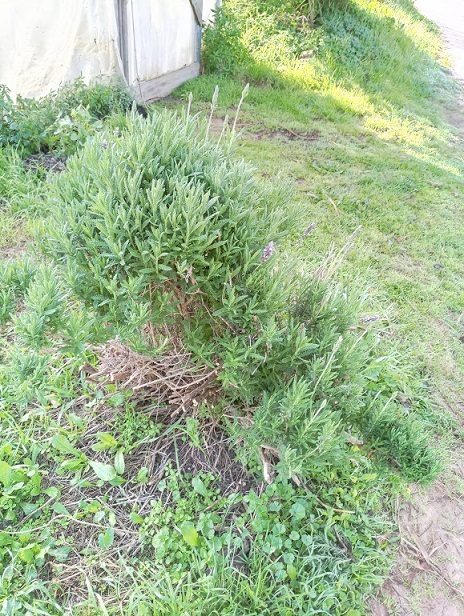 Now, back to my neglected lavender - see those woody dry stems surrounding almost the entire lavender? These are the "forest’s" lower stems, which formed when the lavender was still young. Two-three years have gone by and the "forest" has grown and turned thick and woody. With no one to care for it, light didn't reach the bottom stems, and the only area that still looked nice is the upper part - which has been was exposed to sunlight. Now, begin by pruning and removing the dried woody stems. Make a small hole using your pruning shears, right in the middle, where I marked the yellow circle in the picture. All you have to do is keep pruning, remove the dead branches and stems, and try to prune as low as you can to the their base. Slowly, remove the dry dead stems one-by-one until the lavender looks cleaner, less dry and more greener. You’re doing great!! You just made your lavender stronger and healthier, and I have no doubt he is grateful. What will it look like after it’s been pruned? To be perfectly honest, at first it will probably look bad. But, in just few weeks it will have rested and recuperated and will have had a chance to grow new flowers. Be patient, it will be well worth it. 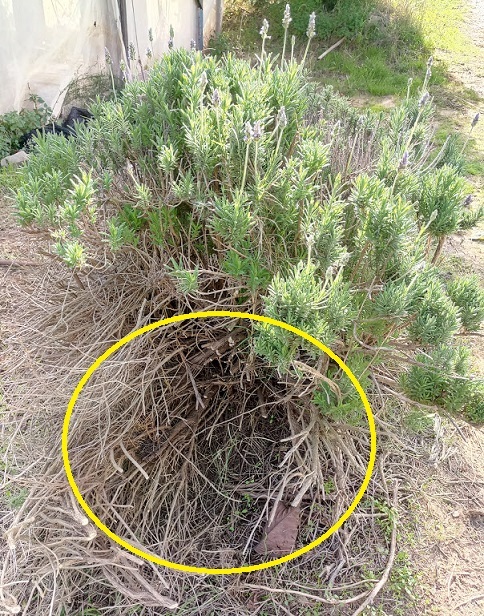 The only thing you should see after pruning your lavender is the "small thick forest" above the ground. See how it has shrunk? Be very careful not to prune too hard. 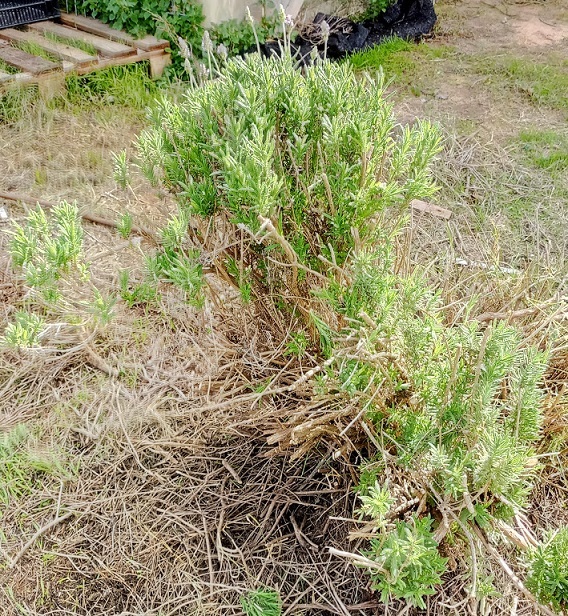 The green part with the leaves on it should be left alone - in a few weeks the lower part of the plant will get new growth and you will be able to remove more dead stems. You are more than welcome! And no, there is no secret here, it depends only on your time and patience. You don't have to remove all the dead ones at once, by removing most of them you will already allow new air and sunlight to come in. Now hold on tight, because you will soon get a surprise! For pruning lavender, my preferred pruning shears would be heavy duty by pass hand pruners. Lavender has tough woody stems, which only a small but tough pruner can handle.